Media effect or media replacement? | Can social data be used to predict elections? Online political information seeking, at least in the data we’ve gathered so far, happens in short, concentrated bursts. When we began the project, I (JB) was hoping that these bursts would tell us something about how people inform themselves about contemporary democratic politics. However we quickly saw in our first post that the peak of information seeking activity falls after the election itself takes place. How can this be explained? So far we’ve been toying with two theories, developed out of the observations below. One: this behaviour is driven by news media coverage. People see the elections reported on TV or in the papers, then look them up online to find out more. If the peak in news coverage coincides with the day of the election, and its aftermath, then its logical that the peak of information seeking would occur shortly after that. The second is that this behaviour is instead kind of replacing news coverage. People want to know the result of the election, especially if they participated, but for whatever reason the news media does an ineffective job of informing them of the result, so they look online instead. One way of trying to distinguish between these two theories is by looking at information seeking activity during the European Parliament elections in countries with different election dates. The European elections in 2009 ran from the 4th to the 7th of June, but the final results were only announced on the 7th. Countries voting on the 4th, 5th and 6th would therefore have had a kind of information gap, whereby voters couldn’t find out the precise result of the elections. If information seeking is driven by a media effect, we might expect these countries to peak on the 8th (when the results are reported). If it is driven by a media replacement strategy, we would expect it to come the day after the relevant country’s election. Right? Below are the info seeking graphs for the Netherlands and the Czech republic. 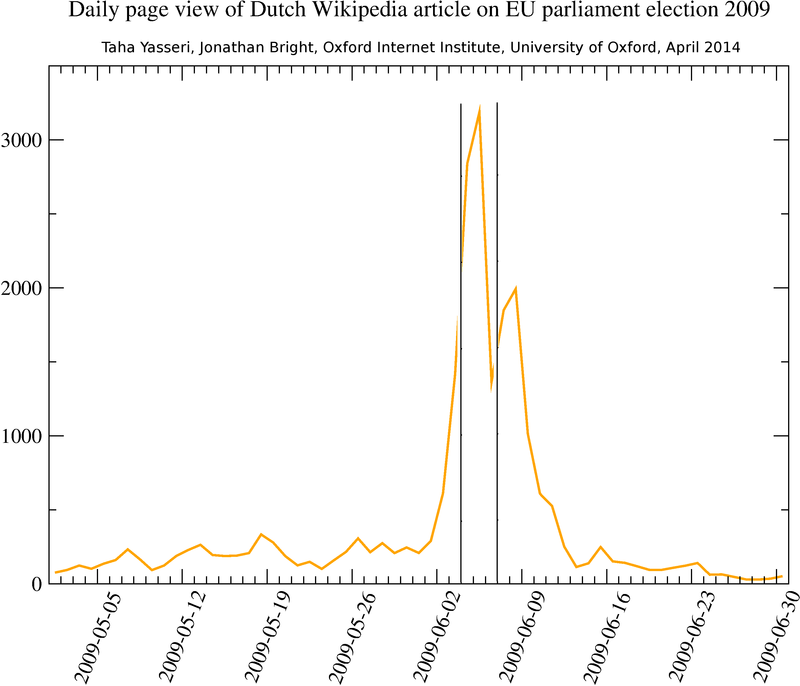 As usual we are looking at page views of the Wikipedia page for the 2009 European Parliament elections in the language of the country of interest (so the Dutch and Czech versions). The Netherlands voted on the 4th of June, while the Czech Republic voted on the 5th. Somehow, these graphs offer support for both theories, because they contain two peaks, one the day after the elections, and one the day after the results were reported. Well, none of this is perfect of course. Just because they can’t report the final result doesn’t mean the media can’t report (I believe) regional results within their country, and I think exit polls are also allowed. Finally they may just cover the elections on the day, even without reporting the results in detail. So media effects could still be the driving force. More importantly perhaps, the two theories aren’t really mutually exclusive. In future work we are going to look at other Wikipedia pages which are more specific to the country in question. This will allow us to look at other early voting countries which don’t have a unique language (Austria, the UK, Ireland and perhaps Cyprus if the stats are high enough). This entry was posted in Information Seeking, Wikipedia and tagged data, EUelection, oii, wikipedia on April 22, 2014 by jonathanbright.